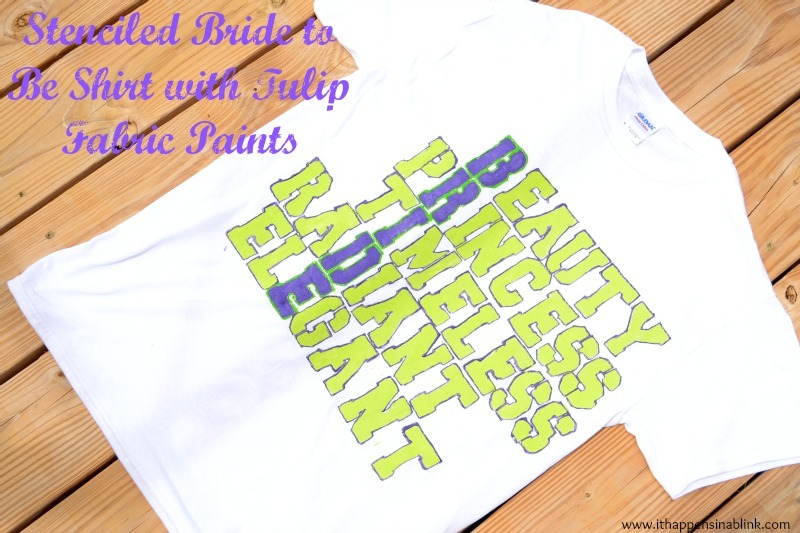 Disclosure: The paints to create these Bride to Be shirts were supplied by Tulip. All ideas, creations, and opinions are my own. My sister is getting married in a few months. Congrats sis! I wanted to make something fun and special for her, but also something a little nostalgic. As kids, we would always fabric paint (a.k.a. “Puffy Paint”) with Tulip Soft and 3D Paints when we would visit our grandmother’s house for a sleepover. We have lots of memories of fun times creating and painting our 90’s fashions with just a small amount of sisterly arguing. Does this Tulip video bring back any memories? 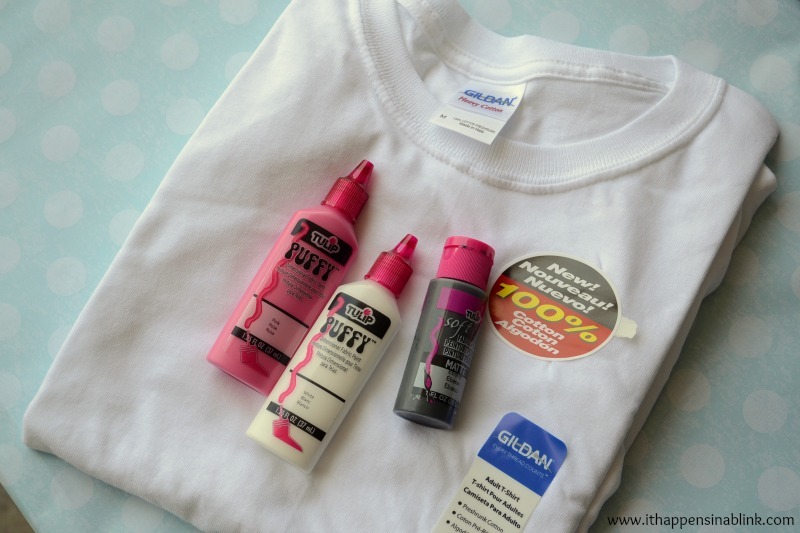 So when I received the opportunity to try the Tulip Soft Fabric Paints and Tulip Fabric Dimensional Paints, I knew exactly what I wanted to try- something that would bring back those old memories with a modern twist. Here’s a look at the items that I got to play with from my Tulip goodie box. 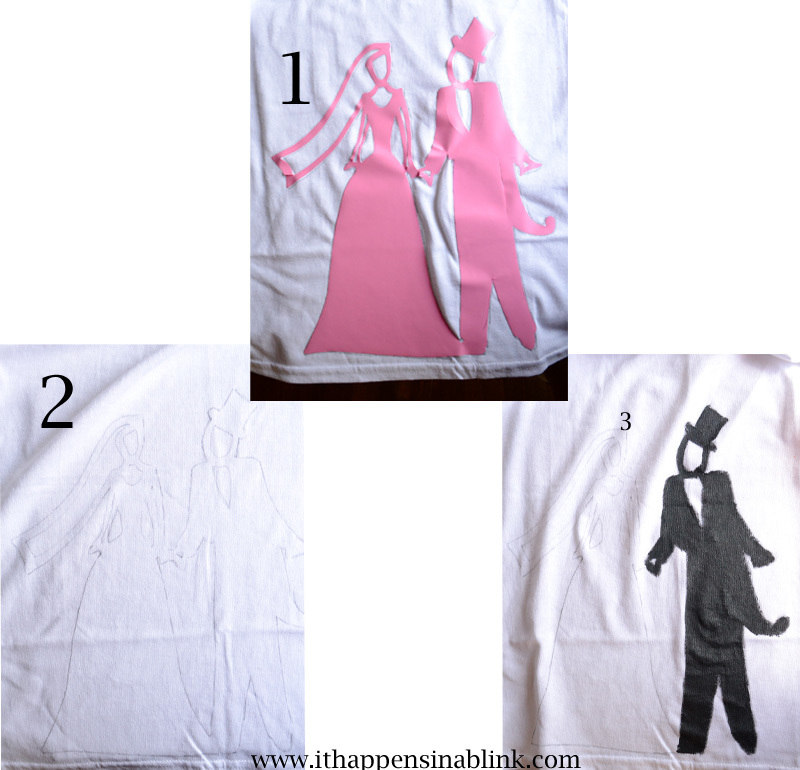 I’m sharing two Bride to Be shirts- one that I made utilizing a vinyl cut-out from my die-cutting machine, and the other using letter stencils. 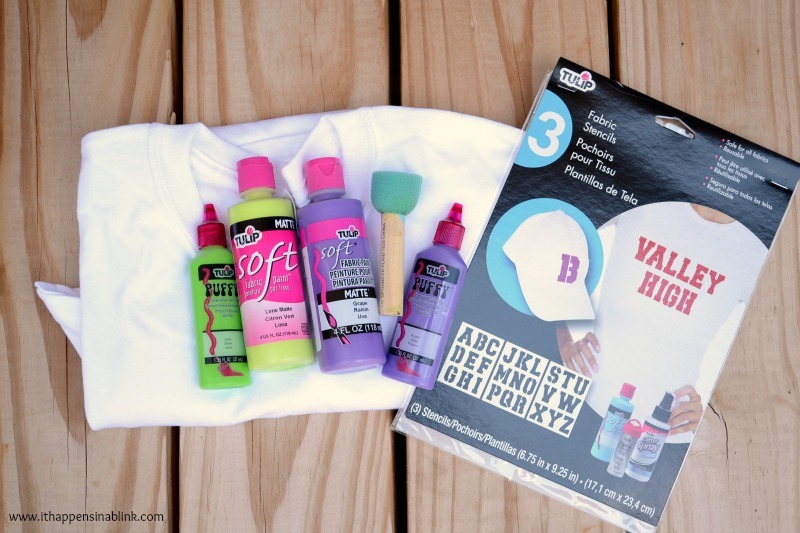 Before starting one of these projects, be sure to refer to my Tips for Awesome Fabric Painting. Vinyl stencil OR free-hand- If you are a good free-hand artist, then you could probably free hand this design. I am not, so I cut a vinyl shape with my die-cutting machine and used this as a stencil. For those interested, I used the Cricut Stretch Your Imagination cartridge. Begin by using the pencil to lightly sketch the design onto the shirt. It may help to do a pre-sketch on paper prior to starting on the shirt. I cut a vinyl stencil and applied it to the shirt. I traced around the stencil and then removed the vinyl once finished. Once satisfied with the shirt design, I removed the vinyl (see the below picture for examples). 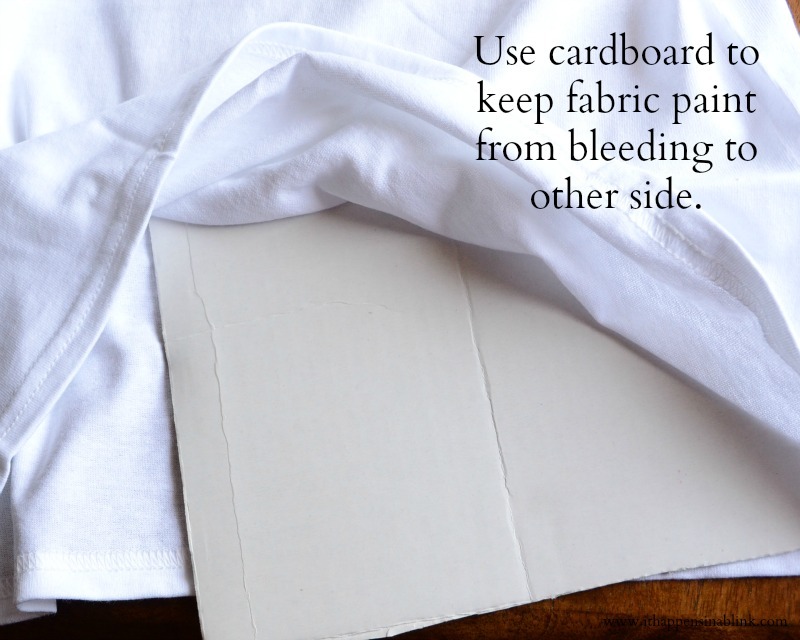 Put a piece of cardboard in between the front and back shirt layers to prevent paint bleeding. The darker the paint color, the worse paint bleeding will occur. Using the Ebony Tulip Soft Fabric Paint and a paintbrush, fill in the groom. Let paint dry. Paint at least two more coats of the Ebony Tulip Soft Fabric Paint to get complete coverage and let dry. Now it’s time to outline the groom. With White Tulip Fabric Dimensional Paint, steadily outline around the black paint of the groom. Move on to the bride. Using Pink Tulip Fabric Dimensional Paint, outline the bride. Pay close attention to be sure the light pencil lines are covered. Let dry. 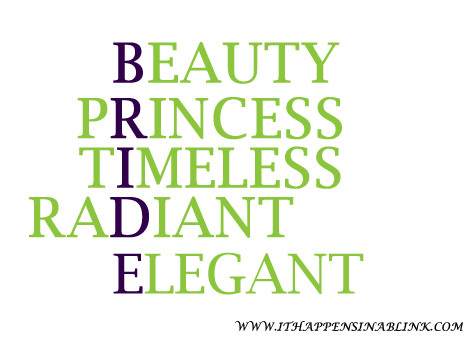 I then free-handed the word “Bride” above the bride silhouette for an added touch. 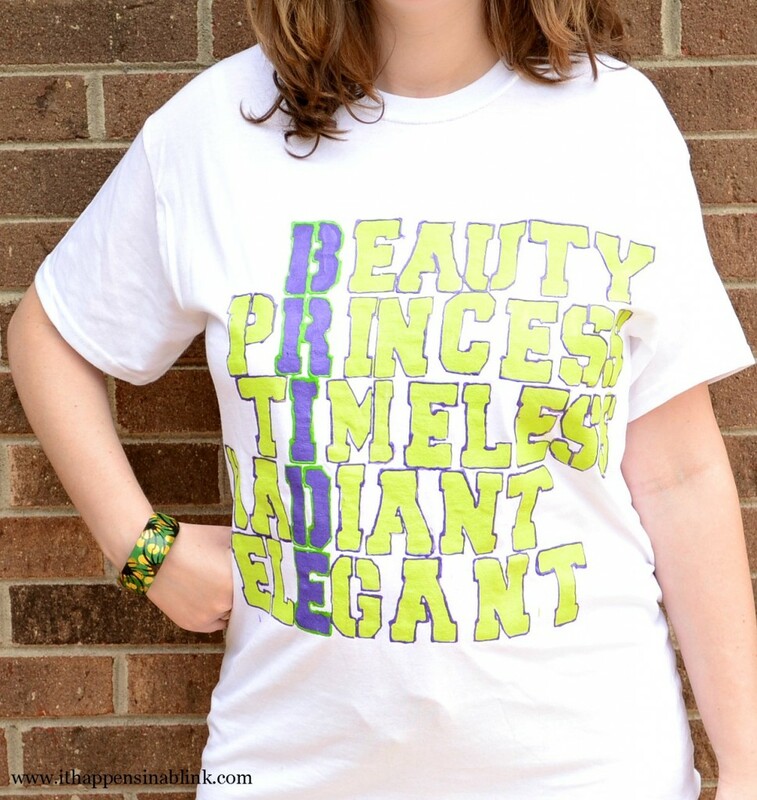 Getting started correctly is the main component to this shirt. If the first letter is misplaced or crooked, all the words could be off. Begin by laying the shirt out flat. With a pencil, draw a light line where the first letter (the first letter should be the “B”) will go. Place cardboard underneath the shirt. 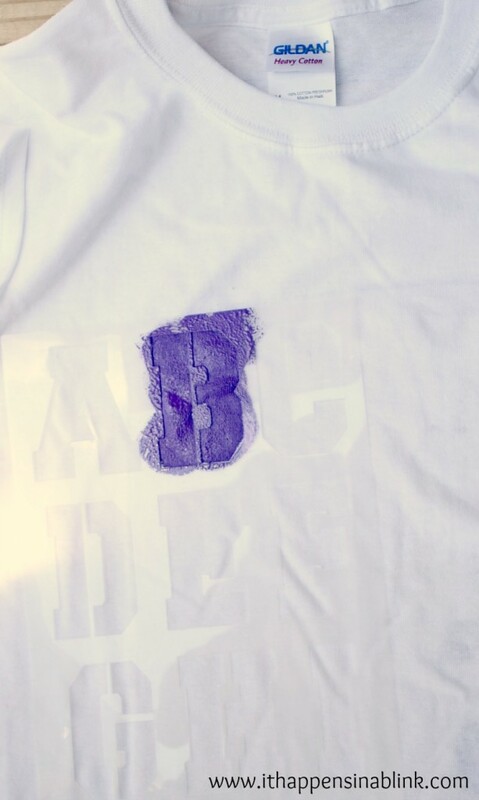 Using the stencil, purple Soft Fabric Paint, and sponge, paint the ‘B’ at the line. Now go underneath the ‘B’ and do the ‘R’. 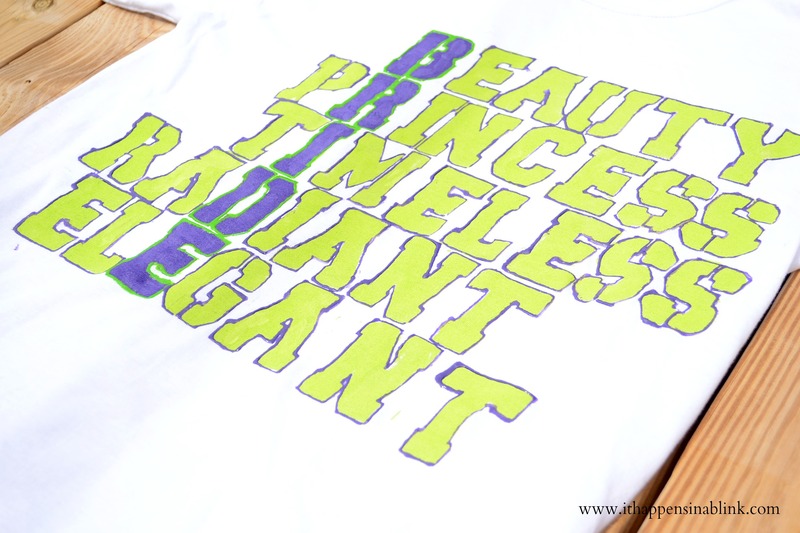 The tricky part here is to make sure that the stencil does not lay flat down on the ‘B’ and ruin that letter. I also didn’t want paint on the underside of my stencil because then it would get on the shirt. 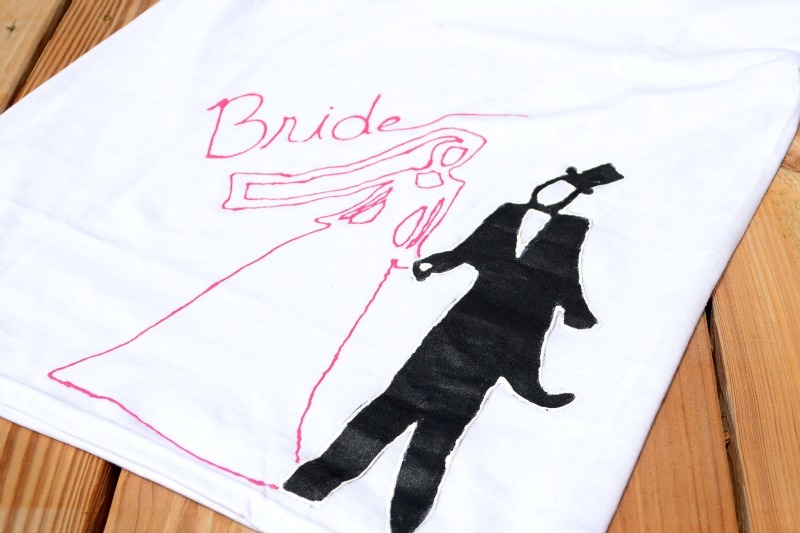 Continue down the shirt until the word ‘BRIDE’ has been completed. I then let this dry overnight. Now come back and do the rest of the letters/words across the shirt in lime. Use the same sponge technique as above. See the above matrix to help with word placement and with spelling. Double-check the spelling each time you do a letter. Let this dry overnight. Take a look at the letters. If another coat is needed for coverage, use a regular paintbrush to fill in the letters. Be sure to keep the paint within the letter. Bring out the Purple and Lime Tulip Fabric Dimensional Paint. Outline the purple letters with the lime paint and the lime letters with the purple paint so that they pop. Let dry. 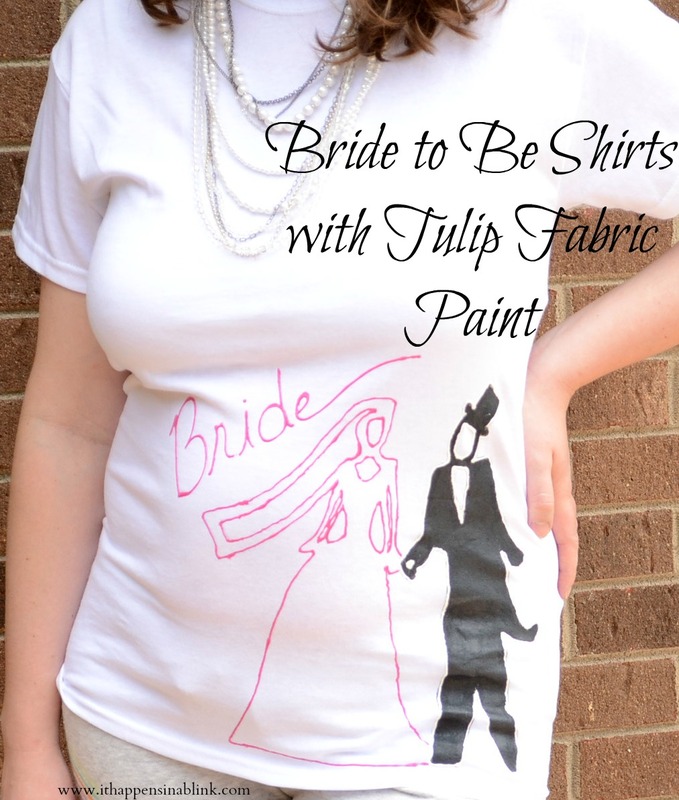 These shirts would be so fun to make at a bridal shower as a gift for the bride. The activity would bring back lots of memories, too! Need more ideas? Visit the Tulip blog. The paints we knew in the 90’s are the great products Tulip still delivers. Tulip continues to be a craft favorite in households today! In addition to Tulip Soft Paints and Dimensional Fabric paints included in my post, Tulip is known for it’s wide variety of Fashion Glitters, Glam it up Crystals, Fabric Markers and One-Step Tie Dye! Find all your favorite Tulip products by clicking here. In fact, all this summer Tulip is bringing tie dye to the masses with their Tie Dye Your Summer campaign! Visit their Tie Dye Your Summer site at Tie Dye Your Summer. They have so many fun tie dye videos and inspirations as well as an awesome giveaway of a tie dye iPad and party (it really is an amazing prize pack that you’ll want to enter! Click here to enter this exclusive giveaway! To stay up-to-date with Tulip, like them on Facebook, follow them on Twitter, follow them on Pinterest, and subscribe to their blog! What a sweet gift!! Love the bride and groom one especially! And I totally remember painting shirts…and anything else I could get my hands on…as a kid! These are so cool! Love the idea and the look. Nobody I know is getting married anytime soon but I am definitely Pinning this for the future! Puff paint has come a LONG ways from back in my middle school days. Fun ideas. I love the one with the bride and groom. Fun ideas! Nice job! Really great idea. These are wonderful. How cool! These are SO cute! I remember using Tulip Paints as a kid! I should get some for my daughter, she would love to make something with them! 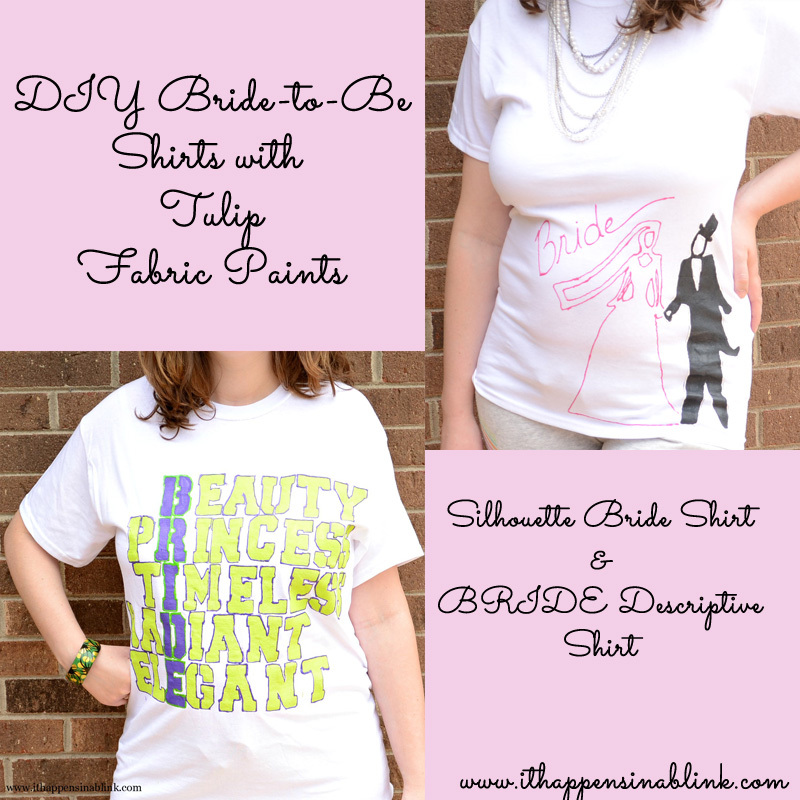 I think they’re both super cute but I’d have to say that my favorite is the Bride Silhouette shirt. I’ve never used fabric paint (hangs head in shame) but this definitely makes me think I could do it & be successful 🙂 TY for sharing! That one is my fav, too!